"Why Machine Tools Continue To Have Quality Problems after Linear Calibration"
Ok, so you've just spent two shifts completing the linear calibration on your machining center and the first batch of parts that comes out are out of tolerance. You ask, "What in the world could be wrong now?" If this has ever happened to you, chances are you've fallen into the linear positioning trap. Why do we say trap? Most machine tool manufacturers only focus on linear positioning. Ask them for specifications on machine tool geometry and you get a lot of hemming and hawing. Why? Well, it's because linear positioning is an easy thing to calibrate. A good quality machine can probably position to .00005" or so without much trouble. That same machine, however, may, over time, have trouble holding .001"/ft. for straightness or squareness. This is especially so when you consider that seasonal temperature variation can have a profound impact on a machine tool's ability to hold alignment tolerance. And because comprehensively checking alignment using conventional methods (levels, squares and straightedges) takes a lot of time, manufacturers of mass-produced machine tools have had to rely on their machining processes, designs and some quick go-no-go fixtures to "calibrate" machine geometry. As a result, they focus on linear positioning as the "true judge" of a machine's quality and performance and are very successful at promoting the linear positioning of their machine tools as the sole indicator of quality. While it's true that linear positioning is indeed important, it is NOT the only story. Calibrated linear positioning will not correct a face cut that is out of tolerance due to a straightness problem or an elliptical hole in a part due to machine squareness problems. Even today's new controllers that purportedly correct geometry errors by programming geometry offsets cannot correct a column-squareness problem on a boring mill (the hole will be in the right place but will be elliptical). These and many other part-quality issues can only be cured by proper geometric alignment. 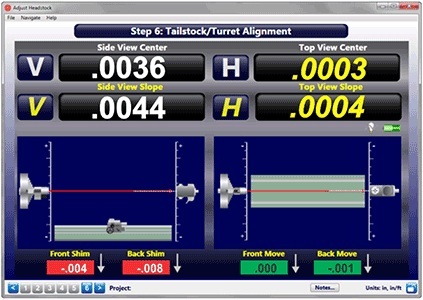 The right way to calibrate machinery is to check the geometry (alignment) FIRST. Once the machine has been properly aligned, then, and only then, should the linear calibration be calibrated. Whether you use indicators, electronic levels, interferometers or geometry lasers, like our L-743, you will cut better parts, have less downtime, and save more money by checking BOTH alignment and linear positioning. So go fight the production manager, talk with the plant manager or who ever else will listen, but start aligning those machines and do it NOW.